On Friday, August 20th, 2010, I took the motorcycle up over the much-traveled Imogene Pass Road, reported in this post here. As I reported, I went through the Tomboy Ghost Town. 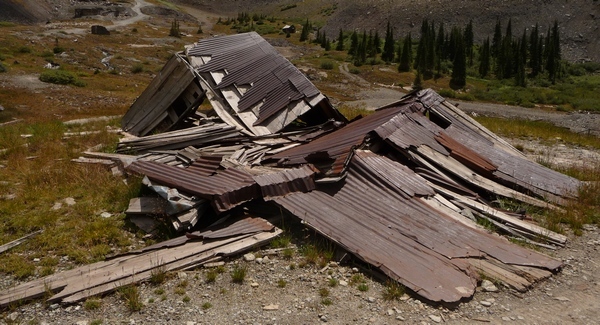 These structures have been allowed to fall apart—no work was done to “arrest decay,” so decay has been entirely unarrested. Shame, really, given how many structures there were. 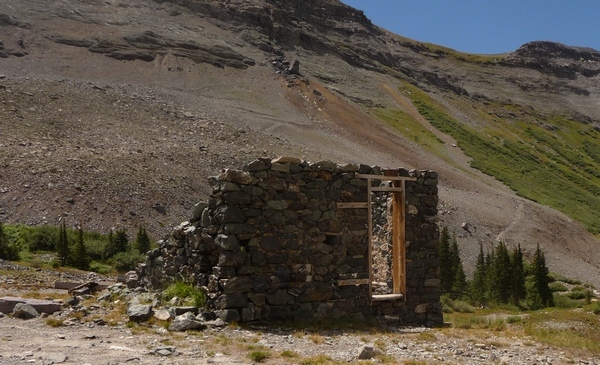 I suppose in the Telluride area this might be referred to as a "starter home"! The foundation of the mill is all that remains. The small stone structure shown in the top photo appears here at the bottom center. 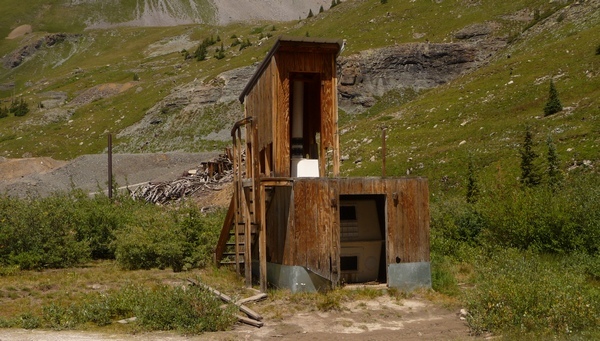 This building appears to have all the makings of a relatively modern composting toilet. But I'd say this one offers no privacy at all! The building can't be more than a couple decades old, given the technology, but the harsh winters here can lay waste to anything. A rather impressive building must once have occupied this extensive foundation. Again, a rather large building must've sat atop this foundation. Note little red brick structure at left. This is a closeup of the red brick structure shown in the previous photograph. The brick must've been imported, as there is no red soil nearby from which to make red bricks on site. I couldn't discern this structure's purpose. This entry was posted in San Juan County. Bookmark the permalink.